While Shiva and I bask in the cold November rain on our first official holiday, we have asked several bloggers to fill in for us with their own stories. At this point, Shiva is a little worried. Shiva, my loyal furry friend, thinks I will have my work cut out for me when I get back to work. Especially after today’s post, brought to you by That Jen K of Back Alley Soapbox fame. Not only is Jen a fellow Canadian, she also resides in my former home city of Calgary, Alberta. For that she has my deepest sympathy. Jen is a strong activist for animal welfare in Calgary and I wish I had known her when I lived there. If you are not already reading her blog, you are seriously missing out! It’s no secret that many of us “dog bloggers” spend a lot of time off-line working on various skills with our canine companions. Whether it is practicing something fun like agility weave poles and tubes, or something challenging like working towards loose-leashing walking with a reactive dog, we put a lot of time and effort into building skills and trust. Heck, some of us even take it a step further and test out clicker training with the cat! Unfortunately, it just happens to be the case that most of the general public doesn’t really see the point of some of the basic obedience skills like a 20 minute long-distance sit-stay. Nor do many appreciate the accomplishment and all the hard work it takes to get there. Of course, sometimes, you can spruce up an old favourite for an immediate increase in public admiration and appeal. But when it comes to showing off our dogs – and our relationships with them – tricks are the ultimate crowd-pleasers. From shake-a-paw/high-five, to dancing, to catching treats tossed in their direction, everyone gets a kick out of dog tricks – and of course they’re a blast to teach! And I’ve heard of some pretty cool dog tricks in my day. But when it comes to teaching Moses tricks, we had trouble coming up with something unique and interesting. I mean, he’s a pretty big guy, so speed and agility aren’t really his strongest suits. 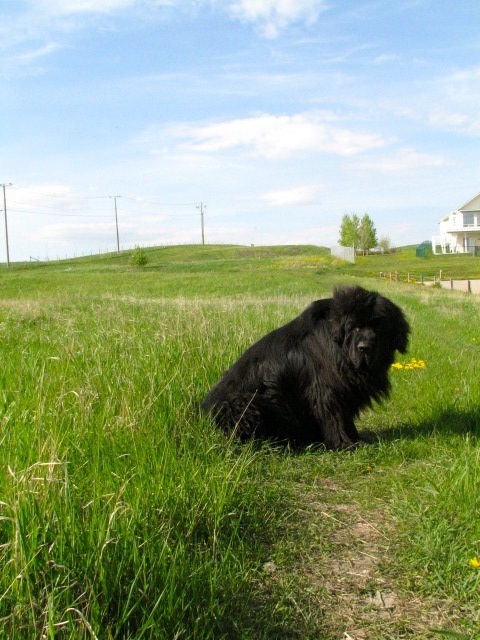 But then it occurred to us – we have a Newfoundland. 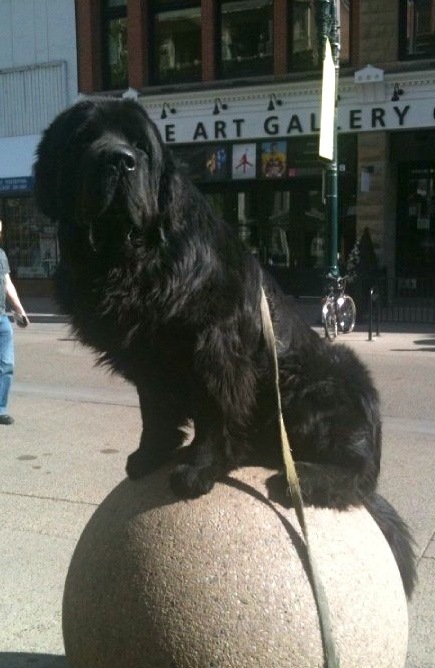 And what is a very common Newf characteristic? In reality, drool isn’t just a characteristic. It’s a hazard. It is not uncommon for Moses to grab a drink in the kitchen, saunter into the living room, and shake his head free of the slobber. It’s just like going to the Blue Man Group; those in the “splash zone” should be prepped with ponchos. out of the water after a swim, or any other time we want attempt to pre-empt the inevitable soaking. And how did we get there? We discovered if you blow lightly into Moses’ face, the tickling causes Moses to shake his head and send drool flying. So, using the simple premise of capturing the behavior and putting some verbal associations with it (easier said than done, but that’s the cliff notes version), we were able to come up with Moses’ “motorboat” signal. And even though it might not be something super cute like rolling over and “playing dead”, we’re happy to say it’s both practical AND a crowd pleaser! So now I’m curious: what are some of the most fun, challenging, or unique skills and tricks you have mastered with your pooch? Or what goals to you have for new ones? Many thanks to Kristine for offering me the opportunity to guest-blog! I have to admit I’m not a big “trick” person. But Kristine, and now you, are wearing me down. I’ve found that teaching Honey tricks improves her confidence. Although I used treats to teach her to “high five,” performing the trick seems to be its own reward now. My husband has also taught her “circus” which is to stand on her hind legs. I’d like to teach her to fold laundry. But I guess I’d have to rewash it to get rid of the dog hair, huh? Ha! Now folding laundry would definitely be a practical trick! Or maybe loading the dishwasher? Wait – I’ve got it – harnessing Honey’s tail as a duster! Yes! Fold laundry! Why didn’t I think of that??? Oh yeah– need opposable thumbs. Darn. That is an awesome trick! We have friends who have done something similar to the verbal signal “yoga”. Since we are always working on obedience, we don’t do many tricks. I have been trying to teach them to hang one of my socks over their noses while I put the other sock/shoe on. I known, not dignified for hunting dawgs. 🙂 Our Golden picked this one up right away, but those Chessie want to “hold” it in their mouths…so you know…the sock gets slobbered up. So now I know what I am going to working on this weekend! Getting the Newfs to fling slobber on command! It took us a VERY long time to work up to Moses’ very solid sit- and down-stays. Now we’d trust him to do half an hour in the middle of a busy dog park from 50 feet away. But it took a a year to get there. And now we’re starting back with the basics with Alma – she’s solid for 30-60 seconds depending on the location, but just at the end of a 6 foot leash. But we’ll get there – after all, she has an Olympic legacy to uphold! Cute tricks. The sit-stay on top of the ball is adorable. I enjoy teaching my dogs tricks, my Lab is my faster learner. Besides all his Rally commands, (which I consider tricks), he knows to “shake hands,” and then, to shake “the other one.” He can roll over, and he can spin – which he absolutely loves to do. I am also teaching him to retrieve dropped items, like papers, and keys…it’s a lot of fun to teach tricks, but I try to use that same attitude while teaching any of my dogs their ‘serious’ skills. I think roll-over is one of the cutest tricks dogs can do – something we never bothered to try with Moses, since rolling over just isn’t something he does very often naturally. We may give it a go with Alma, though – we’ve found her sleeping flat on her back a couple of times! You’re right – perhaps the reason tricks are so fun to teach is that they’re not the “serious” commands in our minds, so we’re so much more relaxed about it (and therefore so is the dog). It would probably benefit everyone to see all other exercises in the same light! I think tricks are a great thing! I teach the most useless tricks ever (like blowing bubbles in a bowl of water –i think THIS TRICK should precede your motorboat trick for extra effect) and then I have trained really handy tricks (like taking off my socks–and optionally putting them in a laundry basket). Before Shayne became as friendly and comfortable around people I hated always telling people “sorry, you can’t pet her” particularly kids… BUT what i was able to say is “Sorry you can’t pet her but she’ll show you some tricks!” it kept the kids happy and kept her safe from sticky fingers. I’ve been able to put “sneeze” on cue for Elka, because she gets so excited when trying to tell us she has to go out, she frequently sneezes a lot. So, for the 2+ years we’ve had her now, every time she’s sneezed (and she looked especially shocked as a puppy every time she sneezed) I would exclaim “You sneezed!”. That progressed to “do it again” or “sneeze!” and when she did it, there would be clapping praise and treats. Now she’ll frequently kind of do a little fake sneeze when asked. I don’t get why people don’t get dog training either. Dogs of any size should be trained, for safety, if nothing else. It’s a very frustrating thing to me. Sneeze is awesome – we’ve noticed Alma sneezes quite a bit, so maybe we’ll have to adopt that one for her! And re dog training: I could NOT agree more! To me, who doesn’t do a lot of tricks – just getting the basics for the rescue dogs takes a lot – the tricks are like ice breakers in the routine of obedience training. They need similar cues and attention but with a more relaxed, fun attitude, once you get back to the serious stuff, I’ll bet it goes better. My Dobie/hound mix, Justus, doesn’t do a trick yet but he does a wicked fast down when I hold my hand up like a stop sign (the very, very long term goal being for him to stop and down off leash even if yards away were he to see my hand up). LOVE “motorboat.” Need to find a means for “quiet” for the Coonhounds when out in the yard :). HA. Yeah, for us it was all-business obedience at the beginning with Moses – no tricks beyond high-five. I can see definite value to mixing fun stuff in right from the start. I love teaching tricks to Gwynn. I use them as a break between obedience type training, because he enjoys them. His favourite is definitely the bow command. he does it so often, he’s clearly figured out it’s a crowd pleaser. We’re working on play dead right now. We take him to my grandmother’s nursing home, and being able to get him to do all sorts of tricks is a great way of cheering the seniors up a bit. 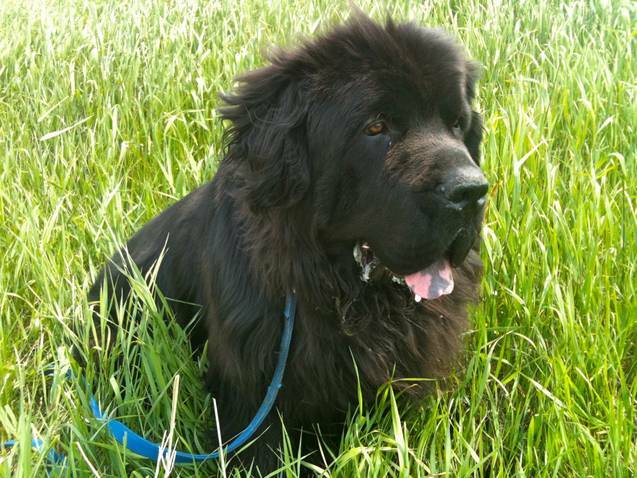 Gwynn is so cute – I bet he’s a hit at the home! Why would you WANT more drool??? Glutton for punishment are you! Our Best Friend can sit, beg, wave, lie and play semi-dead, and “twist” (turn in a circle). His sit/stay used to be a LOT better, but now he’s testing limits all the time. Silly puppy. Haha – well, Alma doesn’t drool nearly as much as Moses (but she seems to stick her face on more stuff – so it’s like less drool in more places), so she probably won’t need a motorboat command. But she’s pretty agile and athetlic by comparison, so we’ll think of all sorts of fun stuff for her. Play semi-dead? Hahaha. I would like to see how that goes! Haha – as long as it’s when requested – and the breath isn’t too bad – puppy kisses can be pretty cute! The biggest crowd pleaser my dogs have, for the general public, is Pallo’s leap-into-my-arms. It was super easy to teach, taking about three training sessions, and never required treats of any kind. It is a reward in and of itself for him to perform. Haha – that sounds great! I dare not try that with Moses – I would collapse like a house of cards. You have to love a trick that’s practical! lol We do nursing home visits, and “take a bow” is always a crowd pleaser, although it has no practical value! “Take a bow” would be a great trick on its own, or after finishing off different one! Cute trick, and I love the name, motorboat! No drool here with my sheltie mix (thank goodness) but she’s also learning a sneeze on cue – that’s a fun one. We’re taking a studio training class, and she LOVES tricks so we’ll have quite a repertoire eventually. Sienna’s favorite trick is sitting up, which she does to strangers just to hear them say ‘awww.’ Jumping over things is also a crowd pleaser. My personal favorite trick of hers is ‘find the car’. Which also usually impresses people. 🙂 In my area, I find that stays are very impressive to people as well. Which is kind of sad in a way, since a solid stay should be a basic. When I first read the title of this post, I though it was referring to using tricks as a reinforcement for the dog – another useful thing about them! Find the car? With holiday shopping coming up, I can see immediate value to that! Tricks are great! I too use them as an ice breaker for dog shy kids/people. Luna knows quite a few like shake (with either paw), hi-five, double 5, touch, bow, typical sit stay stand down (on most any object), watch, wait, spin, play dead, speak, speak softly, fetch, and she loves to shut doors. I find the hardest part of tricks is thinking of them. She is not good about touching light with her paw, so that limits a lot of the cross paws type tricks. I need to get a book and just work my way through it with her. It is a great thing to do when the weather does not let us get out as much as she needs. I love the motorboat. Practical and adorable! Kolchak and I love working on tricks. Not only are they super cute, but I find his overall obedience is lightyears better as long as I keep him working on something new. When we aren’t working on training both him and I tend to get lazy and lackadaisical about obedience.